The manager screen provides an interface which enables user to perform all kinds of diverse operations for test suites and test cases. Operations like viewing, prioritizing, sorting, copying and re-grouping tests can be performed using this screen. User can filter test cases on the basis of suite's title, test case's title, test case's priority, tags applied, requirements linked with them while defining cases, and custom fields that are defined to be used for test cases. 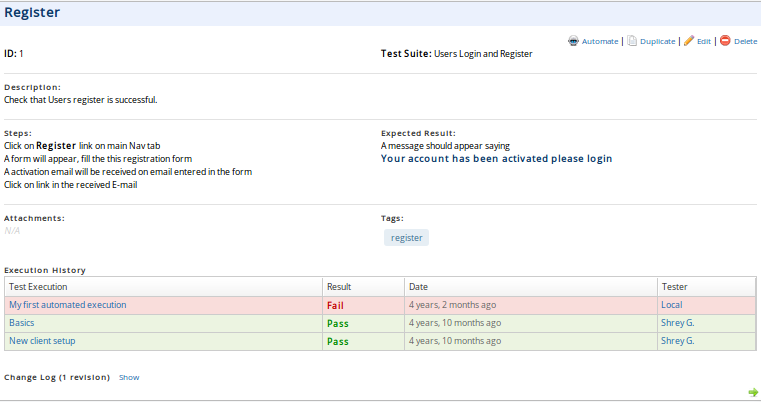 When test suites and test cases are present under a project, they will be shown in a tree like structure on left pane. The test suites and test cases under a suite can be expanded or collapsed by either clicking onto the test suite or by clicking on the icon provided for the purpose. 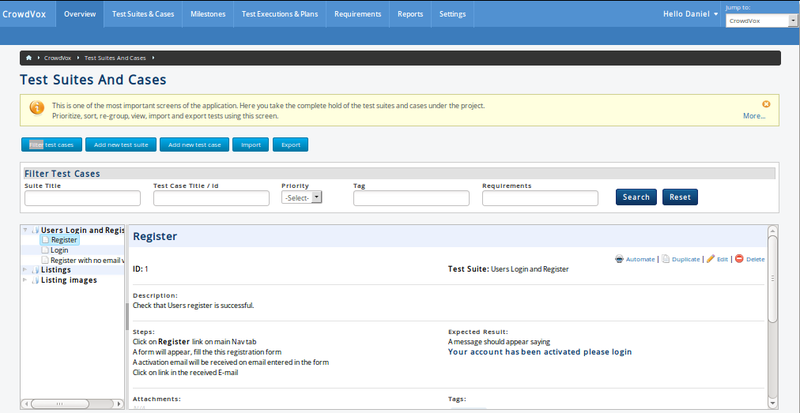 While all options available through this menu are straight forward, the option of linking all test cases to requirements mean that when you click on it you will be shown a window where you can enter a comma separated Ids of requirements that you want to be linked with all test cases under selected suite. The history of executions (if any) for selected test will be shown in tabular format. It would be possible to navigate through the peer test cases under the selected suite, edit or delete current test case using the links on right pane. If a recent change has been made in the suite tree (hierarchy) as a result of drag and drop of test suites and cases, then a page refresh is required to have proper navigation. When User has opted to filter the test suites and cases then he can simply key in the search criteria in the respective boxes he wants to filter the list on the basis of, once he starts keying the related options will be suggested and appropriate option can be selected. Once the filter is applied, the list of test cases and their respective suites will be restricted to the criteria selected. When filter is applied, Reset option can be used to remove the applied filters and show all cases and suites.